Beth and Noah went on their annual early fall mother-son camping trip this weekend. They camped in Shawnee State Park in south central Pennsylvania, toured Lincoln Caverns, and had other adventures. 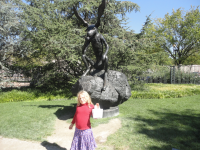 While one of her mothers and her brother were enjoying the natural world, June took in some culture. I’d been wanting to go the Degas/Cassatt exhibit at the National Gallery for a while and Beth had originally suggested we try to go on Rosh Hashanah, which the kids had off school, but it ended up falling between two other days when Beth was leaving work early (Wednesday to take Noah to an orthodontist appointment and Friday to pick him up from school and leave on their camping trip), so she had to beg off, with regrets. I thought I’d take the kids anyway, or maybe just June, as Noah had an English paper he wanted to write so he wouldn’t have to do it on the camping trip, but I ended up deciding not to go partly because Noah objected to being left behind and partly I thought there was a better chance he’d actually finish the paper if I stayed home and kept him on track. (I found out later in the day what he’d really been interested in was the going out to lunch part of the plan and not the exhibit, which might have changed things if I’d known it at the time.) He did write almost a page, which was not as much as he hoped, but it was something. The outing was not exactly a treat. 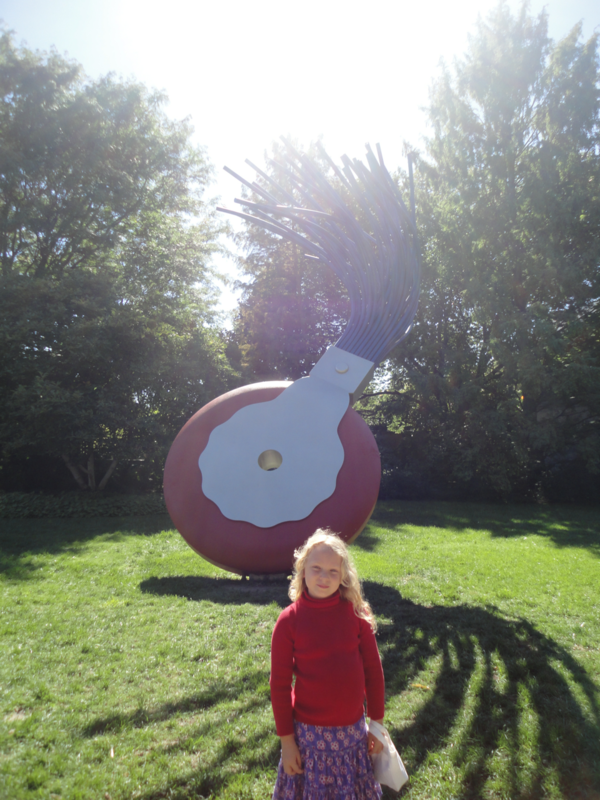 June had no objection to going to an art museum but she wasn’t excited about it either. However, it would be one-on-one time, more so than if we stayed home and I cleaned house (which was the alternate plan), plus we’d been to Chuck E. Cheese for a school fundraiser the night before and I let her stay almost two hours, eating pizza, playing arcade games, and running around with her best friend and then I took her out for frozen yogurt, so I didn’t feel too bad about choosing an activity I wanted to do. Getting out of the house was more difficult that anticipated. June was slow to get dressed because she was upset (to the point of tears) about losing her progress in a long, multi-level game on the Electric Company website because she’d forgotten her username and couldn’t save the game. I hadn’t made her quit in order to leave, she had just gotten tired of it and quit around the same time I wanted to leave. So we missed the 9:28 bus and then the 9:58 bus just didn’t come and when the 10:28 bus was late I was coming very close to throwing in the towel on the whole outing but at 10:34 a bus came and we boarded it. I’d even risked running back into the house shortly before the bus arrived to get the camera battery I’d left in the charger and was rewarded with a working camera. I also read a chapter and a half of The Grim Grotto (Series of Unfortunate Events #11) aloud to June while waiting for the bus so the time was not entirely wasted. I’d chosen a Metro stop that required a line transfer for two reasons, because it was closest to the museum and also because there’s a Starbucks right next to it. It was so close to lunchtime it seemed like fortification was in order if I wanted to go straight to the exhibit rather than the café. There were no more transportation issues and by 11:35 we were leaving Starbucks and walking to the museum, vanilla milk and a latte in hand and vanilla scones and a toasted bagel in our bellies. As we approached the West Building I noticed a poster for an Andrew Wyeth exhibit I hadn’t realized was there. I wondered if we could see both before June lost interest in art. The National Gallery of Art is very large and even with a map, I still needed to ask for directions twice before we found the Degas/Cassatt exhibit. Once we were inside, though, we were immediately rewarded with the sight of the exhibit’s most famous painting, Little Girl in a Blue Armchair. And then they just kept reiterating this fact in different ways. It made me wish Beth were there so I could whisper to her, “Did you know Edgar Degas and Mary Cassatt had no carnal knowledge of each other?” but instead I stifled the urge to laugh because I didn’t think June was listening to them and didn’t really want to have to explain. The Wyeth exhibit was right next to the Degas/Cassatt exhibit and I couldn’t resist going in, although this one was less kid-friendly, being nothing but paintings of windows. How fascinating, I thought, and how boring, June seemed to be thinking. “He sure did like windows,” she said. “Why do you think an artist might like about windows?” I said. “I dunno. The light?” she said. I agreed. The windows do change the light in the painting and they also let you see two scenes at once, the inside one and the outside one, I explained. I stopped short in front of Evening at Kuerners, because I’ve seen this painting before, three years ago at the Brandywine Museum in Chadds Ford, Pennsylvania with Beth. I even mentioned it as one of my favorite Wyeths in this blog post. It was on the wall in between two other paintings of a single lighted window of a house or barn seen from outside at night. Then we saw a painting of N.C. Wyeth’s studio from the outside on a snowy day. Beth and toured that studio on the same weekend getaway, albeit on a sweltering July day. When we’d finished with Wyeth I asked June what she’d like to do next and she choose to see some of the sculpture in the permanent collection. There were a lot of Rodin sculptures and also some Degas dancers. I pointed them out to June. It was a lot less crowded away from the travelling exhibits. Often we were alone with the guards, one of whom told June she looked like a Vermeer painting. I wondered which one he had in mind. After a late lunch in the café, the one with the big waterfall right outside the window, I bought some magnets with Andrew Wyeth paintings on them–Evening at Kuerners (because if it’s going to follow me around I might as well take it home) and also the one of the studio. We paused in another gift shop long enough to read a children’s book about the painting of Little Girl in a Blue Armchair and we learned the answer to two of June’s questions. Cassatt met Degas when she moved to Paris and he actually painted part of the background of that very painting. 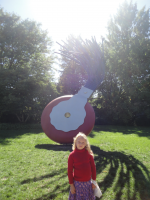 Next we headed for the sculpture garden. It was around two in the afternoon when we left the museum and it was noticeably warmer than when we’d entered. I was worried June would be hot because in the spring and the fall she has a tendency to dress for the weather that’s just around the corner instead of the weather we’re actually having, so on this sunny day with temperatures in the low eighties, she was wearing a ribbed turtleneck, a corduroy skirt, and tights. 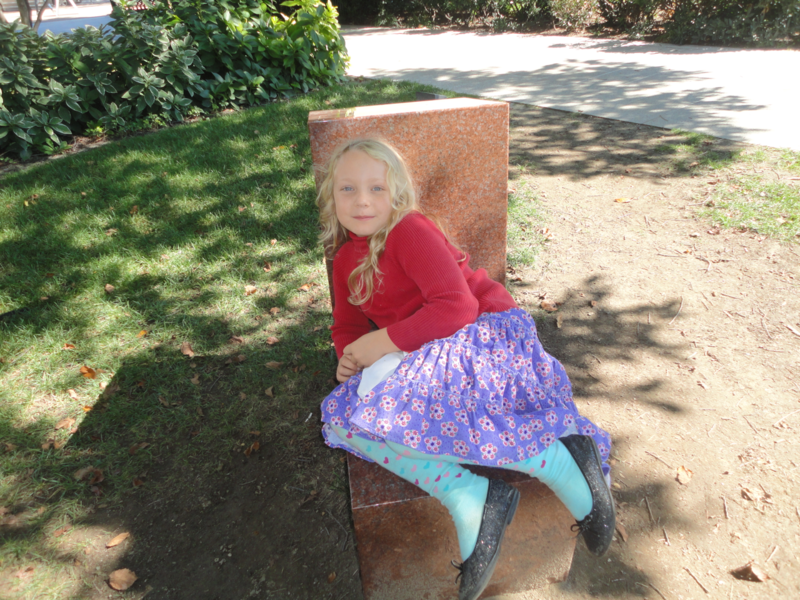 But she didn’t complain as we wandered through the sculptures. It had been so long since we’ve been there that she didn’t remember it and she enjoyed the more whimsical pieces. After a half hour or so we were both ready to leave. We headed home. I rested a bit and then cleaned the kitchen, made dinner, menu-planned for the next week and made a grocery list. There was time for a few rounds of Mad Libs before June went to bed, and after a shower, I fell into bed with a book, our artistic day over.